A Visitation -- a spontaneous encounter with a loved one who has passed on into the next world -- is a life-altering and transformative experience. Sometimes a loved one returns to say "Good-bye, for now," or to bring a vision of the afterlife or a lesson for this life. Often the spirit brings the blessed peace of healing to a grieving loved one -- someone who has lost a parent, a partner, or a child. However they come, these extraordinary moments of reunion leave the living blessed and forever changed. According to a recent USA Today/CNN/Gallup Poll, almost 70 million Americans believe that it is possible to communicate with the dead, and millions of people the world over have experienced a visitation. When people feel that it is safe to speak openly of these encounters, they tell stories that in the past have been kept close, "secretly whispered from parent to child, from friend to friend, from heart to heart." Since early childhood, Lee Lawson has herself had many visitations, treasured experiences that have profoundly shaped and molded her life. 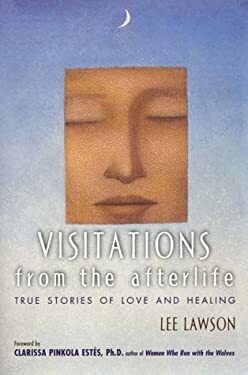 "Visitations from the Afterlife" is a passionate invitation to explore and be blessed by this remarkable collection of visitation stories from around the world. Whether or not you have experienced a visitation, you will find these accounts compelling evidence of the afterlife, revealing to us that life and love continue into eternity. This beautiful collection of stories brings hope and peace to the heart, helping us to realize that we live on after death, and that one day we will be reunited with the ones we love. Used Like New (2 available) Book in almost Brand New condition. 100% Money Back Guarantee. Shipped to over one million happy customers. Your purchase benefits world literacy!